Rome! One of the most talked-about and critically acclaimed cities in the world. Whether it be the delicious Italian food, the chic boutiques on every corner, or the adorable vespas zipping around the streets, there is nothing about Rome you’ll hate. There are, however, some must-sees that you have to be sure not to miss. The Colosseum// This is a given. 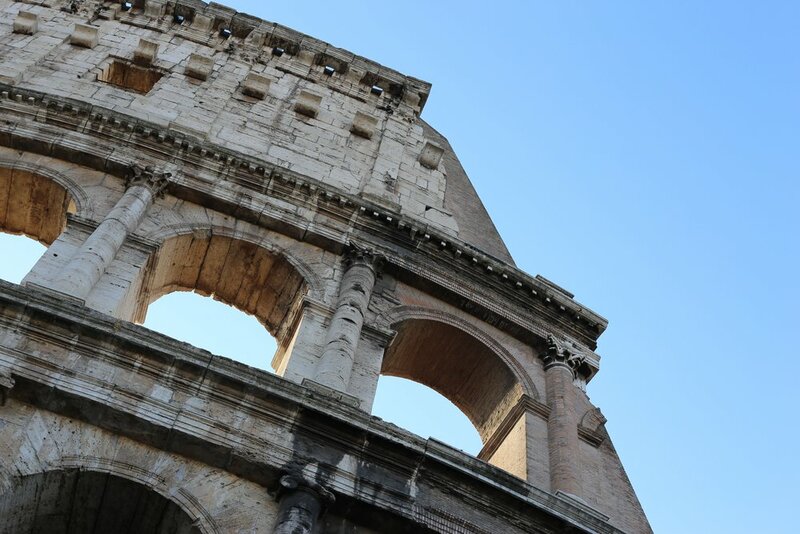 One should be required to visit the Colosseum when visiting Rome; wandering under the crumbling arches or marveling at the fading frescos seems somewhat surreal when you realize that you are quite literally looking history square in the face. The iconic symbol of the Roman Empire does not disappoint; you will practically feel the history seep into you as you wander the corridors. Trevi Fountain// Another iconic landmark that will not let you down. Even before seeing the elegant white marble monument, you can hear the hundreds of thousands of gallons bursting into the fountain; it sounds like an collection of natural springs and waterfalls right in the middle of a huge metropolitan city. When you turn the corner you are immediately taken aback by the grandeur of it all; bright and beautiful marble gleams in the sunlight and nearly blinds you, but, wow, is it worth it. Also, as a bonus, there is an endless amount of gelato stores nearby. Gelateria San Crispino// Speaking of! While you’re at the Trevi fountain, don’t pass up the chance to go to one of the most famous gelaterias in Rome! Specializing in unique flavor combinations, this place is definitely worth the minute-long stroll down the street. Partheon// Another Roman Empire classic, the Pantheon is a breathtaking temple that was constructed roughly two thousand years ago. Though a bit crowded both in and outside, the tourists are worth being able to see this magnificent structure. Perhaps the most awe-striking part is the perfectly circular oculus cut out of the ceiling, which acts as the only source of natural light. While admiring it, it’s crazy to think of the incredible lengths the architects and builders went to to be able to have it stand as it does today. The Vatican// When in Rome, take the opportunity to visit a completely different country! Yes it’s true, the Vatican City is technically it’s own country, which is just a raindrop in the ocean of amazing things you will learn and experience when you visit this awe inspiring palace. Even for those who have no affiliations with the Catholic church, it is stunning to see the the ever-intricate architecture and hundreds, if not thousands, of colorful and lively paintings, sculptures, and more. This includes, of course, the Sistine Chapel, which completely and utterly lives up to its reputation.